A little bit of a knitting update. 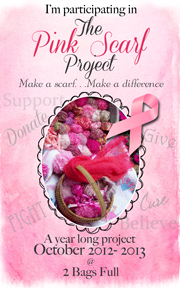 A few weeks ago I learned about the Pink Scarf Project hosted by Vicki at 2 Bags Full. This really tugged at my heart, and I wanted to participate. Even though I am a beginner knitter, I wanted to send something I had made. Not much quilting going on around here, so I thought I would share a quick and easy recipe with you. A great way to use up left over chicken. My family has enjoyed this recipe many times. It's quick and easy to put together. I started out slow with these fat quarters. I love fabric with words, and was delighted to find these in two color ways. I have been admiring Accentuate the Positive by It's So Emma. When I found this at a JoAnn's I gave a little squeal, cause I could use my 40% off discount coupon! 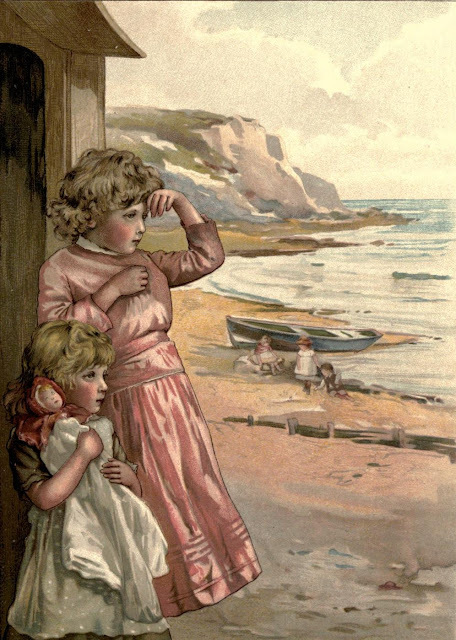 I've not seen any of It's So Emma patterns in our area. And on the way home, we stopped at Hancock's in Paducah. do you recognize this fabric?? Paris Flea Market.............. all on sale! I'm telling you, if I lived any where near Hancock's I would be broke all the time. So my quilt shop/fabric adventure turned out pretty rewarding. Have you ever had a wrestling match with your vacuum cleaner? We had company staying with us for a couple of weeks, so this morning I decided to get things back in order and cleaned. My soul waits for the Lord more then watchmen wait for the morning. YES!!! I am knitting a pattern!! Woo-hoo!!!!! I've been looking online and checking out knitting videos from the library. The first DVD was really the best for teaching the basics. This was where I learned how to make the dish cloths. Tracie Wunderlich does a fabulous job of going through each process slowly and understandably. What I like about the DVD's is that I can stop them and re-watch anything I did not understand. The second DVD really has helped me to learn about the different stitches and what some of the symbols mean. There are some projects too, but I've used it mainly to understand a lot of terms that completely had me confused. So I found this pattern at the Knitting Geek. It's called The Simplest Shawl in Stockinette Stitch. I really want to learn how to make shawls. I pulled out some left over yarn, and started working the pattern. It was going pretty well, until I realized that I was not making the pattern on the Purl side. I ripped it all out and started again. This time when I did a yarn over I did another loop over the needle as when doing the Purl stitch the yarn needs to be in the front. So far it's working. Whether I am doing it right or not, I'm not sure, but for my sample pieces I'm happy that the pattern is working. The question was prompted by a comment asking if this was a Featherweight? I brought out my sweet little Featherweight so you can see the difference. As we were traveling home from our vacation, we stopped in a couple of Antique Malls along the way. It is really amazing the things you find in some of these places. But one thing is for sure, if your sweet Hubby decides that he wants to buy you an Anniversary present, be sure to say yes, yes, yes! One of the fun things we do when we travel is visit different Antique Malls. Most of them are out of my price range, but it's still fun to wander around and learn about the vintage thingies. Of course I always spy a quilt now and then. Unbelievable!!! An amusement park in the middle of the mall! Somehow I just don't think you could ever get me on one of those rides. Not now, not ever! Wouldn't you like to ride on this right after lunch?? If you would like to learn some interesting facts about Mall of America check out THIS LINK. On our way home, we did make a couple of stops. This Quilt shop was pretty big. Lots of pretty samples made up. These last two quilts were gorgeous!! And............ our final Quilt stop was in Quilt City USA! See those orange signs on the door? Any fabric with the orange sticker was priced at $5.99 a yard. Lots of current fabrics. I had to take a picture of the store because the only other time I was there was during the week of the Quilt show and this place is usually mobbed. Yes, yes, yes, I did bring home a few goodies. But I will have to share those on another post. Now it is my understanding that this shop was was Amanda Jean's (crazy mom quilts ) home base until she recently moved. The shop had a cozy warm atmosphere, with lots of great fabric lines. I really loved this quilt, but they were out of the pattern. And how about Lori Holt's Scissor quilt pattern?? One more stop tomorrow. Hope you aren't weary of seeing these great places. I love to taking you along on these quilt shop tours. I am always amazed at how each Quilt Shop that I visit has it's own personality. And they each have so much inspiration to offer. Lots of pretty quilts on display too. A friend picked me up one day, and she took me to her favorite quilt shops. This is one of them. Don't you love the cute sign? The shop was right in the middle of town. Very neat, very clean, and a touch on the modern side. But some very, very pretty quilts. And that's not all........ I've got more pictures to sort through, so tomorrow I will continue with a tour of our travels.